Traditionally, the Islamic states have had to reach out to Western capital markets to obtain funding for major projects. Islam's prohibition on the collection of interest (riba) made it difficult to find buyers within the Muslim world for debt securities issued by sovereign nations, even predominately Muslim ones. In recent years, however, the invention of a financial instrument widely called sukuk—a kind of bond structured so as to be acceptable under Islam—has enabled governments of Islamic nations to tap into an entirely new capital market. Muslim investors, buoyed by the rise in the price of oil, have devoured the new sovereign issues of sukuk, developed and marketed by the governments of Muslim-majority nations. Islamic governments did not, however, abandon conventional bond issues with the emergence of sukuk, which are still a small fraction of debt issues in the Middle East. In the past ten years, several governments have issued both sukuk and conventional bonds within a year of one another. These bonds have behaved very differently on secondary markets. Though they cannot be paid traditional interest, investors in sukuk still expect to be compensated for the money they lend sovereign borrowers. The traditional measure of return on a bond is its "yield," roughly put, the amount the borrower gets paid back annually relative to the market price of the bond. Traditional financial models expect yield to rise with the riskiness of an investment. The yields on sukuk and conventional bonds, however, have behaved quite differently from one another—even when the issuer is the same government. In some cases, the behavior of sukuk yields has seemingly defied principles of mainstream finance theory. The forces driving this disparity need to be considered in order to understand how and why Islamic nations structure their borrowing as they do. To do so, evidence for a difference between the investment bases for the two types of bonds must be examined. If present trends continue, parallel capital market infrastructures could emerge in Islamic markets. There are some fifty to 260 sheikhs worldwide who have the recognized expertise necessary to approve sukuk bond issues. 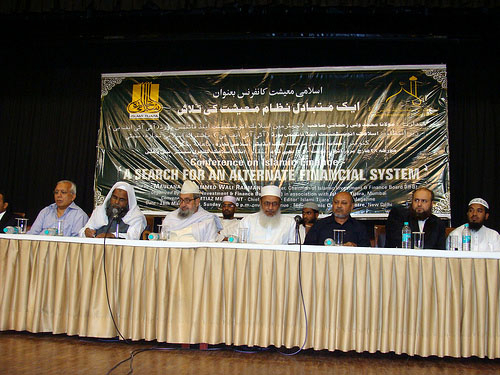 Dependence on such a small group of Islamic scholars, like those seen here, increases risk as bonds deemed conforming to Shari'a may turn out to be non-compliant. A crisis in confidence could threaten the entire Islamic finance industry. Appreciating what drives investment decisions in Islamic capital markets is critical not only to those who participate in financial markets but to all parties affected by capital markets' self-sufficiency in Middle Eastern economies. And whatever you lay out as usury, so that it may increase in the property of men, it shall not increase with God; and whatever you give in charity, desiring God's pleasure—it is these [persons] that shall get manifold. Shari'a's limitations on financial transactions extend beyond the mere charging of interest on loans. Generally speaking, Shari'a does not allow for investors to make money from money. Accordingly, strict adherence to Islamic principles of finance frowns upon both interest-bearing loans themselves and the secondary markets that emerge to profit off them. Yet Shari'a law is not without an appreciation for the time value of money. Most Islamic scholars allow for goods to be sold on credit (nasi'a) at a higher price than they would be sold for with cash upon delivery, a practice similar to many forms of Western consumer credit. The Hadith, the oral records of the teachings and actions of Muhammad, even point to a seventh-century version of futures contracts (salam) whereby farmers were paid gold in advance for wheat to be delivered at the harvest. Islam's prohibition on the collection of interest but acceptance of the time value of money has been explained in terms of "certainty." Islam accepts that the lender is forgoing the opportunity to engage in profitable transactions with his own capital while it is being used by another. He is, therefore, entitled to reimbursement for missed opportunities. However, since these opportunities are, in theory, unknowable beforehand due to the uncertainty of business, it is deemed wrong to determine interest payments in advance in the form of a contract guaranteeing a particular interest rate. Payment for foregone opportunities must be made after the fact on the basis of actual return on the borrowed capital and can never be made legally binding. By the standards of modern Western finance and from the creditor's perspective, this is not a favorable structuring of loans. Such an arrangement is known as an "unsecured loan" because the lender has no recourse should the borrower decide not to repay the loan. Moreover, the lender has nothing to gain should the borrower's investment turn out to be more profitable than expected. In practice, Islamic lending becomes, as analysts Iqbal and Mirakhor write, "a charitable act without any expectation of monetary benefit." The Qur'an's distinction between gains from loan interest and the ordinary profits merchants make from shrewd bargaining might seem arbitrary. After all, both are monetary gains made without any "tangible" production. Indeed, the Qur'an makes the contrast by fiat and not by any explicit philosophy of economics: "They say: 'Trade is just like usury,' but God has permitted trade and forbidden usury." It is no coincidence then, that Islam's modern methods for lending appear so similar to an ordinary business joint-venture. By structuring debt in such a way that it resembles trade, modern Islamic finance has found ways of creating an instrument previously impossible under Shari'a, namely, the Islamic sukuk bond. Although there are traditionally hundreds of ways loans can be made acceptable in Islamic society, only a handful of different structures are used in modern global sukuk issues. The predominant forms of sukuk are known as mudaraba, musharaka, and ijara. Mudaraba, usually used to finance specific capital-improvement projects, is a structure in which the lender is considered a part-owner in whatever investment is being made. Coupon payments on the loan are drawn from the profits of the venture according to a ratio agreed upon when the contract is drawn. Should the venture fail, the borrower is not responsible for reimbursing the lender regardless of its solvency as an institution. The mudaraba agreement thus carries a great deal of risk for lenders. Mudarabas were the first kinds of sukuk issued in recent history, usually used to finance municipal improvement projects with the investment of local lenders. Furthermore, under mudaraba arrangements, there is no expectation that the lender provide any managerial help. The structure of choice for sovereign state sukuk issues is ijara. Under this arrangement, the borrower (a sovereign state in this case) sells tangible assets at a price agreed upon by contract to a "special purpose entity" (SPE). This SPE in turn issues sukuk bonds in an amount exactly equal to the purchase price of the assets. The SPE then leases the assets back to the state at an amount equivalent to the coupon payments of the sukuk. At the maturity of the sukuk, the SPE sells the assets back to the sovereign state at a price agreed on beforehand. At this point the SPE dissolves and the ijara contract is concluded. For example, one particular Pakistani sukuk is issued by an SPE called the Pakistani International Sukuk Company Ltd. and not the Pakistani government itself. The sukuk securitization is backed by the 250-mile Islamabad-Lahore motorway, also known as M-2 within Pakistan. This highway was "sold" to the SPE for $600,000,000 in January 2005 with an agreed ijara, or lease-payment, of 5.6 percent on the face value of the bonds with a maturity of five years. Thus, sukuk bond issues are backed by real assets to which all bondholders can claim partial ownership. According to Islamic law, the sukuk issuer cannot guarantee the return of principal or interest payments without turning the agreement into an ordinary interest-bearing loan. The money that bondholders receive must be considered lease payments on the underlying assets and, presumably, reported as such for purposes of taxation. Hence, owners of the Pakistani sukuk backed by the M-2 road must in theory consider their returns on the bond as payments derived from tolls on the motorway. Financial services providers who sell their clients sukuk have an obligation to inform them of where their returns are coming from. In theory, the borrower can legally stop making coupon payments on a sukuk if the underlying asset is not profitable (for example, if drivers stop using the M-2) even if the borrower has other sources of income (such as oil revenues). The sovereign sukuk introduced a new class of investors to government debt financing quite different from the one that had previously bought sovereign debt. While conventional investors have certainly participated in sovereign sukuk issues, Islamic investors and institutions are by far the predominant players. Indeed, according to the Islamic banking unit of the London-based HSBC, the global banking concern that managed Pakistan's 2005 sukuk issue, 47 percent of demand for that bond came from the Middle East, 31 percent from Asia, and 22 percent from Europe. Calculating the size of the sukuk market has been notoriously difficult due to the lack of a central regulatory body or even a standardized definition of what constitutes sukuk. The most widely cited source, the Islamic Research and Training Institute, puts the size of the entire Islamic finance industry at between $700 billion and $1 trillion dollars with an annualized growth rate of 63 percent in 2005. The Islamic Finance Information Service estimated the size of total sukuk issuance in 2007 at $47 billion, an increase of 73 percent over the previous year. The total value of active sukuk worldwide was most recently put at $120 billion by the First International Conference for Islamic Sukuk in Bahrain on March 18, 2008. These numbers might be even larger were it not for a critical sticking point. The main bottleneck in the creation of new Islamic bonds has been a shortage of scholarly boards to approve the bonds. In fact, only somewhere between fifty and 260 sheikhs worldwide have the recognized expertise necessary to approve sukuk bond issues. Within this group, about a dozen take on the vast majority of bond approvals. The Financial Times quotes Yusuf Talal DeLorenzo at investment firm Shari'a Capital as saying that "to sell products into the market, to give them credibility, you go to the tried-and true guys whom everybody knows." Investment banks have spent millions of dollars seeking the fatwas (religious edicts) of this small group of Shari'a experts. Such a small band of preferred Shari'a scholars and the millions of dollars at stake give all the indications of an emerging moral hazard problem within the sukuk industry. In fact, since the recent financial crisis, there have been a few cases of sukuk being retroactively declared noncompliant. For example, in 2009, the Shari'a Committee of the Accounting and Auditing Organization for Islamic Institutions tightened its standards for Shari'a compliance after a number of semipublic sukuk issued by Dubai were found noncompliant. There is concern that should sukuk bonds regularly be found religiously unacceptable after issuance, investors who demand Shari'a compliance might pull out not only from the affected bond but from sukuk bonds in general. A crisis in confidence could threaten the entire Islamic finance industry. The theological research that Shari'a boards do for a particular sukuk issue is entirely out of sight for the average investor. Thus, the failure of a single bond could threaten the credibility of the entire approval industry. It is not known how widespread this fear of a crisis in confidence is within the Islamic investment community. Any perceived risk of such a crisis would probably reduce the trading price of such bonds vis-à-vis bonds that do not contain that risk. All other things being equal, one would expect investors to demand additional return from sukuk bonds over conventional bonds issued by the same sovereign authority due to the potential risk of a crisis in Shari'a compliance. Surprisingly, and contrary to what mainstream risk-return models would suggest, there is little evidence that sukuk investors demand a premium for this risk, at least thus far. One additional potential risk of the current system for judging sukuk compliance with Shari'a is that religious regulatory bodies could use their power for political ends—perhaps by implicitly threatening to declare noncompliance on the bonds of sovereign nations that support unpopular geopolitical positions. Another area of broad uncertainty is whether religious authorities will declare Islamic banking activities (presumable including sukuk) subject to zakat, a kind of tax Islamic governments have historically imposed on wealthy Muslims to fund charitable activities. Conventional bonds and sukuk issued by the same country are extremely similar except for the underlying religiously-informed technical structure. What factors then determine the yield spread, (i.e., the difference in bond yields), sometimes a substantial one, between the two? Normally, riskier bonds have higher yields. Yet, with sukuk, the situation is reversed: Sukuk, which are inherently riskier, often have lower yields than comparable conventional bonds. This fact alone indicates there is more to the sukuk-conventional bond spread than risk of default. While the yields of Islamic and conventional bonds issued by the same country might differ at any given time for maturity-based reasons, it is worthwhile to compare the way market valuations of Islamic and conventional bonds change relative to one another over time. That is, looking at how the spread between valuations of sukuk and regular bonds has varied over time can shed insight into what determines the relative pricing of the two. Of course, fluctuations in the likelihood of default of conventional and sukuk bonds are one clear explanation for the changes in the difference in bond yields between the two. After all, bond returns themselves are highly dependent on the risk of default. While the credit worthiness of the entity behind the bonds is identical (the sovereign nation issuing the bonds), there are two factors that could contribute to a disparity in default risk. First, the intrinsic structure of sukuk puts them at greater risk of default. An ijara form of sukuk, backed in theory by only the operating income of a subset of the government's total assets is most likely riskier than one tied to the entirety of the government's assets. Should the specific assets linked to that bond produce insufficient income during the allotted period, the borrowing government could in theory withhold payments, despite having plenty of other profitable assets. The fact that the sovereign sukuk examined for this study have in practice issued fixed coupons rather than coupons based on the actual returns of the underlying trust assets suggests sovereign issuers wish to eliminate (or at least hide) this source of potential risk. Sovereign entities seem committed to making their sukuk appear as dependable and steady in cash flow as their conventional bonds. Proceeds of the Trust Assets are the sole source of payments on the Certiﬁcates. The Certiﬁcates do not represent an interest in or obligation of any of the Issuer, the Trustee, the Government … or any of their affiliates. … If, following distribution of the proceeds of the Trust Assets, there remains a shortfall in payments due under the Certiﬁcates, subject to Condition 12, no holder of Certiﬁcates will have any claim against the Issuer, the Trustee, the Government. According to these terms, bondholders not only lack a means of recourse should the sovereign issuer decide not to pay its lease but also lack the ability to take control of the underlying assets (which they technically own due to the structure of the "special purpose entity") and liquidate them or use them to more remunerative ends. Sometimes the assets the government sells to SPEs are not ones that could easily produce immediate operating income even if bondholders could take control of the assets themselves. The sukuk from which the above passage is drawn, for example, is backed by a parcel of undeveloped land. The government's guarantee to make timely and complete payments on sukuk is thus for all intents and purposes merely implied. 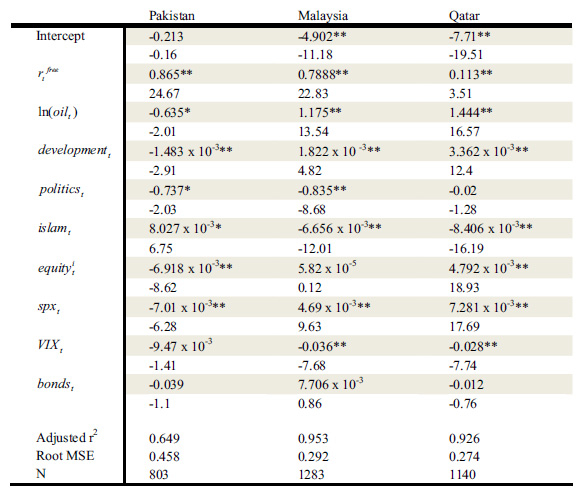 For the purpose of this study, sovereign conventional and sukuk bonds from three predominantly Muslim countries were compared (see Table 1) and the following hypothesis was tested: Do changes in certain macro factors—those economic variables, like gross domestic product or inflation, that affect the broader national and global economies and not just a particular investment—have a different effect on the yields of sukuk than the conventional bonds issued by the same country? 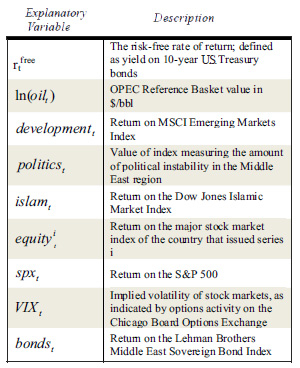 The macro factors selected were not chosen haphazardly: They correspond to possible differences between how conventional investors and sukuk investors view market shifts (See "Methodology" Table 3 for a summary of explanatory variables). Moreover, in some cases changes in macro risk factors would affect the default risk premium—i.e., the amount an investor expects to be compensated for taking on additional risk—between the bonds, and these situations were also examined and tested. Sources: Richard, Kristel. Standard & Poor's Ratings Direct: A Closer Look at Ijara Sukuk. (New York: Standard & Poor's, 2005); Datastream, Thomson Reuters, New York. Overall, the results (Table 2) support the hypothesis that sukuk markets behave differently from conventional bond markets in the same country by virtue of varying sensitivities to external macro factors. Each macro factor (for example, the risk-free interest rate: rtfree) is tested for its significance in determining the sukuk-conventional yield spread. The first number (for example, 0.865 for the risk-free interest rate on the Pakistani bonds) indicates what effect an increase of one will have on the yield spread. In other words, a 1 percent increase in the risk-free interest rate is predicted to correspond with a 0.865 increase in the spread between sukuk and conventional bonds. The number beneath each value is its "t-statistic." This number is simply a measure of how "significant" or strong the result was. Strong results have a single asterisk next to them, indicating at least 95 percent confidence the result did not happen because of chance. Very strong results have two asterisks, indicating at least 99 percent confidence the result did not occur because of chance. Those values without asterisks were found not to be significant in predicting the yield spread between sukuk and conventional bonds. A wide range of highly significant t-statistics across entities suggests that the credit spread between these types of bonds fluctuates predictably according to movements in the explanatory variables. There were also indications that the model as a whole predicted a large share of the variation in the sukuk-conventional yield spread. In the cases of Malaysia and Qatar, adjusted r2 values (the higher the r2 the greater share of the variation has been accounted for by the model. An r2 of .05 means 5 percent has been explained; an r2 of .99 means 99 percent has been explained) of the multiple regressions when combining all the explanatory macro factors together were extraordinarily high (Malaysia: 0.953, Qatar: 0.926). Pakistan also had an impressive, but slightly lower adjusted r2 of 0.649. 1) Associated t-statistics reported beneath coefficient values. 2) Single asterisk (*) indicates significance at the two-tailed 5 percent significance level (p<.05), double (**) asterisks denotes significance at the two-tailed 1 percent significance level (p<.01), for the null hypothesis that the given coefficient equals zero. 3) See Table 3 for summary of explanatory variables. What the results reveal are that a few macro factors can explain a great deal of the fluctuation in yield spread between sovereign sukuk and conventional bonds. The macro factors that had the most significance across all three countries examined were the risk-free interest rate (rtfree), the price of oil (lnoil), developing world stock markets (developmentt), growth in other Shari'a-compliant industry (islamt), and the Standard & Poor's 500 index (spx). Changes in each of these variables affected the spread between conventional and sukuk bonds. What this means is that investors in sukuk are either more or less sensitive to these particular macro variables than the conventional investor. There are logical reasons why investors in Islamic bonds might be more sensitive to these variables than conventional investors. The general finding is that sukuk investors reacted with more passivity to changes in macro factors than conventional investors—as if their investment in sukuk was fixed and not determined by changes in the outside economy. The first and most striking difference in investor behavior between sukuk and conventional bonds is in the reaction of the market to changes in the risk-free interest rate (rtfree). The risk-free interest rate is defined here as the yield on 10-year U.S. Treasury bonds, widely considered in financial markets to be one of the safest and most liquid investments available. Investors in the conventional sovereign bonds reacted to changes in the risk-free interest rate as would be expected: That is, as the risk-free rate went up, the yield on the conventional bonds issued by Islamic nations went up in tandem to match. Strangely, however, the sukuk market remained relatively stable at the same time. The trend could be an indication that while a rosier global economic picture—rising risk-free interest rates normally correspond with a growing economy—encouraged investors to increase investments to sovereign bonds, it did not encourage them to increase investment in sukuk where they would be taking on unnecessary risk of default due to the problematic religious element of the bonds. Sukuk investors were not as influenced by changes in the risk-free rate because investing in U.S. treasury bonds is not permissible under Shari'a. Investors' reactions to changes in oil prices were highly surprising. The model suggests that conventional bond investors reacted to increasing oil prices by buying bonds from oil producing nations and selling those from oil importing nations. This is consistent with the idea that a government awash in oil revenues will be more capable of paying its debts. Sukuk buyers' purchases of Islamic bonds did not offset the movements of conventional bond traders in these instances. Sukuk investors did not react to changes in the price of oil as dramatically. This is particularly interesting in light of the fact that many sukuk investors are more likely to have economic ties to the petroleum industry and, consequently, would have more investable funds as oil prices rise. Growth in developing world economies (developmentt) was associated with increasing demand for conventional bonds in Malaysia and Qatar. As the index rose, signaling greater health in emerging markets, conventional investors felt more comfortable investing in the debt of these countries, bringing down the yields of sovereign issues. The opposite effect was found in Pakistan, probably due to country-specific factors: Pakistan's political instability over the period, including terrorism in the autonomous regions and the assassination of Benazir Bhutto in December 2007, made it an undesirable place to invest relative to other booming, emerging markets. Pakistan's history of leadership upheavals raised fears that the country could default on its debt should the government topple. Thus, while emerging markets as a whole grew, investors chose safer havens for their funds than Pakistan and fled its debt, raising yields. Sukuk investors, investing mainly for a "piety premium" rather than for fundamental changes in the underlying economy, stayed put; consequently, the difference in yield between the two types of bonds shrank. The calculated coefficients on politicst (value of index measuring the amount of political instability in the Middle East region) and VIXt (implied volatility of stock markets), showed a weaker and less consistent impact across the bonds examined. The results suggest that conventional bond investors react more aggressively to adverse changes in the perceived riskiness of markets. As the political instability index rose, yields on emerging-market debt shot up without a concomitant rise in sukuk yields. Thus, sukuk investors appear less sensitive to increasing volatility, perhaps because they have fewer alternative low-risk investments. Also, the relative illiquidity of the sukuk market could contribute to a sense that rising volatility in other markets would not affect a market where there is altogether less turnover. The effects of the changes in the developed world economy as measured by the Standard & Poor's 500 index reinforce what was found with the risk-free interest rate. That is, sukuk investors were more passive about changes in the S&P 500 index. Again, this is probably a function of the fact that sukuk investors were less likely to be invested in the S&P 500 in the first place for religious and geographic reasons. It seems likely then that the differing investor bases of the two kinds of bonds are at the root of the differences in bond yield between sukuk and conventional bonds issued by the same country. The two bond markets are essentially isolated from one another due to the sukuk's religious underpinnings. Consequently, different expectations about changes in returns stemming from systematic risk would create a spread between their yields. It would appear that the sukuk market is a mostly passive one. While conventional bond yield fluctuations can usually be explained by the logical responses of the conventional bond market to changes in macroeconomic risk, sukuk markets evidence little variation in sukuk returns as a result of macro risk. Thus, conventional markets react to adverse or positive news in equity, oil, or risk-free interest rates as would be expected with emerging-market debt securities but sukuk investors mostly ignored these movements. This could be a result of the importance of the "piety premium" to sukuk investors: The unseen utility benefit of holding a Shari'a-compatible bond for Muslim investors is not sensitive to changes in macroeconomic risk. Alternatively, the passivity could be a function of a lack of alternative assets for sukuk investors. Whereas conventional bond investors can easily move to risk-free or less risky assets, sukuk investors have far fewer options. The relative passivity of investors in sukuk suggests that they are not as responsive to conventional financial signals. These results are consistent with the notion that sukuk investors are in general less sensitive to changes in the conventional business markets. For example, while conventional investors increased exposure to debt in developing markets like Pakistan and Malaysia as their economies grew, sukuk investors kept exposures constant. Sukuk research is still in its very infancy. Future research will be greatly aided by the accumulation of new data and issuance of even more sovereign sukuk. While perfect matches of sukuk and conventional bonds from the same country are currently impossible, the present analysis, nonetheless, was able to show the peculiar nature of the relationship between the two markets. Only time will tell if the strange behavior of the Islamic bond yield spread is a consequence of an immature sovereign sukuk market or a permanent feature of the different sensitivities to systematic risk of the two markets. All sukuk and conventional bonds included in the study are sovereign-issued, quoted daily except for weekends and major holidays. The periods vary by bond pairing with the earliest starting in June of 2002 and some continuing until mid-February 2008. All bonds are U.S.-dollar denominated, which eliminates potential foreign exchange rate effects on yield spreads. Analysis was conducted in two stages. First, the standard ordinary least squares estimators (OLS) were used to build the multiple regressions where the credit spread, CSit, of bond-pairing i in time t is the dependent variable, and nine explanatory variables related to theoretical determinants of credit spread are included as regressors. The Arbitrage Pricing Theory (APT) was used as the starting point for security valuation. Simply put, the essence of APT is that in market equilibrium no arbitrage profits can be made (because in efficient markets, traders will eliminate riskless profits immediately). Analysts Stephen Ross and Richard Roll show that a consequence of this assumption is that "asset returns can only come from increasing exposure to market risks. Every equilibrium will be characterized by a linear relationship between each asset's expected return and its return's response amplitudes, or loadings, on the common factors." These "common factors" are the common components of all assets considered in a multifactor model of security pricing. They are typically construed as sources of macro risk. The "factor loadings" are the coefficients on the factors indicating the sensitivity of a particular asset to sources of macro risk. Here, the APT model is chosen over its alternative, the capital asset pricing model (CAPM), primarily because CAPM requires all investors to hold identical market portfolios. This assumption conflicts with two of the key areas of exploration of this study: (1) Muslim investors are more likely to buy sukuk than non-Muslim investors, and (2) sukuk investors, on the whole, have fundamentally different market sensitivities than ordinary investors. Figuring out where factor weightings are substantially different between the two yields will be the key to unlocking what determines the credit spread. Hence, the choice of explanatory variables (see below) will be guided by the search for variables that are weighted differently between the two bond types. The net effect of the difference between two factor loadings (i.e. bk,sukuk –bk,conv) for any given explanatory variable will set that variable's effect on credit spread. Note that CSit is the yield premium of sukuk over conventional bonds. Unlike spread comparisons between risky assets and risk-free assets, the credit spread between sukuk and conventional bonds can take on both positive and negative values (indeed, all four series studied have credit spreads that turn negative at some point, if not much of the time). Descriptions of the regressors can be found in summary in Table 3. The above regression is run three separate times for each entity i using the OLS estimators for the beta values. Where ai is the entity fixed effect and E(ui | Xi1…Xin, ai ) = 0 and uti is a term for all other unexplained variation in the regression. The entity-fixed effect is included to account for country-specific omitted variables that vary across countries but not over time. As earlier, the coefficients are estimated using OLS. Theodore Reuben Ellis is a graduate student at the University of Chicago, Booth School of Business. Prior his graduate studies, he was a consultant at McKinsey and Company. Frank E. Vogel and Samuel L. Hayes, Islamic Law and Finance (The Hague: Kluwer Law International, 1998), p. 78. Zamir Iqbal and Abbas Mirakhor, An Introduction to Islamic Finance (Singapore: John Wiley and Sons, 2007), pp. 61-2. Vogel and Hayes, Islamic Law and Finance, pp. 138-45. Richard, Kristel, "A Closer Look at Ijara Sukuk," Banker Middle East, Feb. 2005, no. 57. Khaleej Times (Dubai), Jan. 23, 2005. AMEinfo.com (Dubai), Mar. 17, 2005. "Islamic Financial Services Industry Development: Ten-year Framework and Strategies," Islamic Research and Training Institute, Jeddah, and Islamic Financial Services Board, Kuala Lumpur, May 2007. Financial Times (London), Feb. 7, 2008. Gulf Daily News (Dubai), Mar. 19, 2008. Financial Times, Nov. 19, 2007. The New York Times, Nov. 30, 2009. Emirates Business (Dubai), Sept. 3, 2009. "Qatar Global Sukuk: Offering Circular," HSBC Bank, London, Oct. 2003, p. 12. Richard Roll and Stephen Ross, "An Empirical Investigation of the Theory of Arbitrage Pricing," Journal of Finance, Dec. 1980, p. 1074. Zvi Bodie, Alex Kane, and Alan J. Marcus, Investments, 7th ed. (New York: McGraw-Hill/Irwin, 2008), pp. 342-3. Related Topics: Islamic law (Shari'a) | Spring 2012 MEQ receive the latest by email: subscribe to the free mef mailing list This text may be reposted or forwarded so long as it is presented as an integral whole with complete and accurate information provided about its author, date, place of publication, and original URL.